You know that you should have a long-range plan for regularly backing up all your important data. But there are times when you want the extra security of backing up an ongoing project at more frequent intervals. The following Automator workflow will do just that by taking items placed in a particular folder and backing them up to another drive. Launch Automator. When prompted to choose a template for your workflow, select iCal Alarm. In the workflow area, string together these three actions: Get Specified Finder Items, Get Folder Contents, and Copy Finder Items. 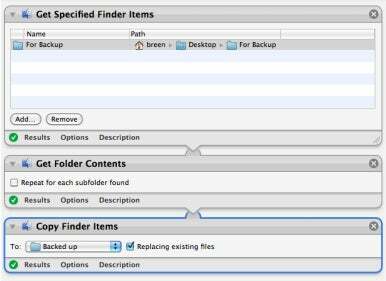 Drag your For Backup folder into the Get Specified Finder Items action to add it. Drag the 'Backed Up' folder on to the pop-up menu of the Copy Finder Items action. In the Copy Finder Items action enable the Replacing Existing Files option. Here's what the completed backup workflow should look like. In plain terms, the workflow takes the items in the For Backup folder and copies them to the Backed Up folder on the other drive. When those files are copied to the backup folder, any files with the same name will be replaced. This ensures that only the most recent version of your files are backed up. In iCal change the alarm time to the end of your work day. 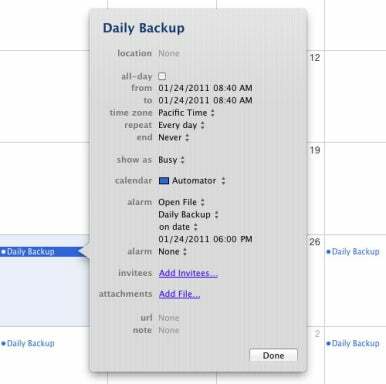 Save and name your workflow—Daily Backup, for example—and iCal will launch. Your workflow will appear in an Automator calendar (which iCal will automatically create if one doesn’t exist), scheduled at the current time and date. Select the Daily Backup event that was just created and choose Edit -> Edit Event (Command-E). In the Repeat area of the resulting window choose Every Day so that the workflow runs once a day. In this same window you’ll also see an Alarm area. Here you’ll discover that your Daily Backup workflow is scheduled to be triggered at the time that you saved it. Change the time to more accurately reflect the end of your workday—6:00 PM, for instance. If you’d like the workflow to be triggered more than once a day, add additional alarms. When creating additional alarms you'll be asked to locate the Daily Backup workflow you created (when you select the Open File command within the Alarm area). You’ll find it by following this path: youruserfolder/Library/Workflows/Applications/iCal. Obviously you’ll want to change the time the second instance of the workflow triggers—11:00 AM, for example.